This month we are getting bob members from all groups together for a special event! We feature Kashif Saleem - Founder of Track'em! When he arrived in Perth he couldn't speak a word of English. Twelve years later he was presenting at a Microsoft Insight conference in front of 18,000 people live and hundreds of thousands on live streaming. How did he get to do that? Come along and here Kashif tell his own amazing story. A simple solution to a complex problem was the calling for Kashif Saleem the Founder and CEO of Track’em. Kashif developed a tracking solution when he witnessed first-hand the problems faced by project teams to monitor and control resources (Assets, Materials & Time) on sites. Track’em is a tracking platform which provides control and visibility of assets, materials and time. With a driving passion for technological innovation, Kashif believes that projects and businesses have massive, unrealised potential to improve their triple bottom line of people, planet and profit. Always ‘hands-on’, he is constantly looking for opportunities to find easier and more efficient ways to do things. Working with clients such as BHP, Rio Tinto, UGL, Downer, he successfully expanded the business and has worked on over 50 projects. Track’em won the Best use of Technology category at the 2014 My Business Awards and was the winner of the 2015 WA Innovator of the Year Award from the Department of Commerce. 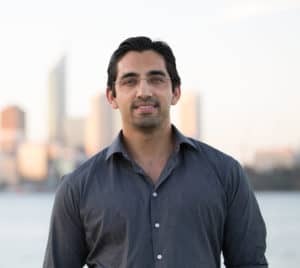 Kashif was a winner in the 2014 WA Business News 40 under 40 Awards and the 2014 Curtin Growth Entrepreneur Award winner. He was also a finalist in the 2014 Ernest and Young Entrepreneur of the Year Award. BUSINESS OWNERS BOARD - GET IDEAS, ACCOUNTABILITY, CONFIDENTIALITY AND SUPPORT FROM YOUR OWN bob ADVISORY BOARD & MENTOR! If you are a business owner in Western Australia, apply to come along to a 'bob' advisory board meeting. You will also get to learn about 'bob' groups and how they can help you and your business get to new heights! Business Owners APPLY HERE to start your complimentary month with BOB.